As a photographer I have scads of photos at my disposal. Whenever I'm in a slump, my archives are just a click away. Today's photos come from the Poetic Winter Challenge last February entitled, "Warmth". Warmth manifests itself in a multitude of ways. The warm sun on a cool day. A cup of tea with cherished friends. A tender touch from someone dear. A beautiful drive through the countryside. Snuggling under the covers with my littles. A brisk walk under the stars. When darkness settles in, these are a few of the things that can illuminate my path and warm my heart. I've also been keeping my mind busy with projects. Burlap projects to be exact. Chalkboard Banner. Rosettes. Wreath hangers. Fabric covered pots. And my latest reveal? 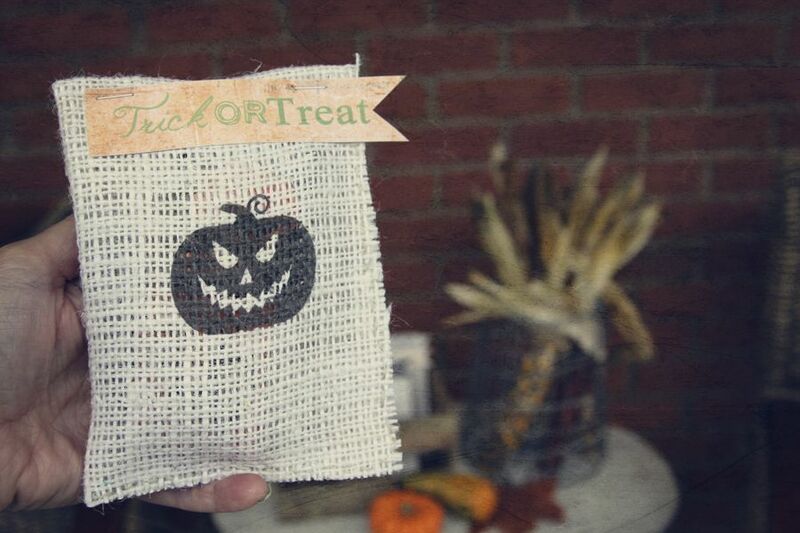 Burlap Treat Bags, just in time for Halloween. They're super easy and come with free printables! Also, don't forget to join Kristi and Rebecca for their Nurture Photography Fall Challenge! That's all for now. Thanks so much for stopping by! I love the quote! And the photos are so beautiful! Oh my, that sunset on the beach is lovely! And I love the one of the messy bed - everyday life makes for such a great photo subject. 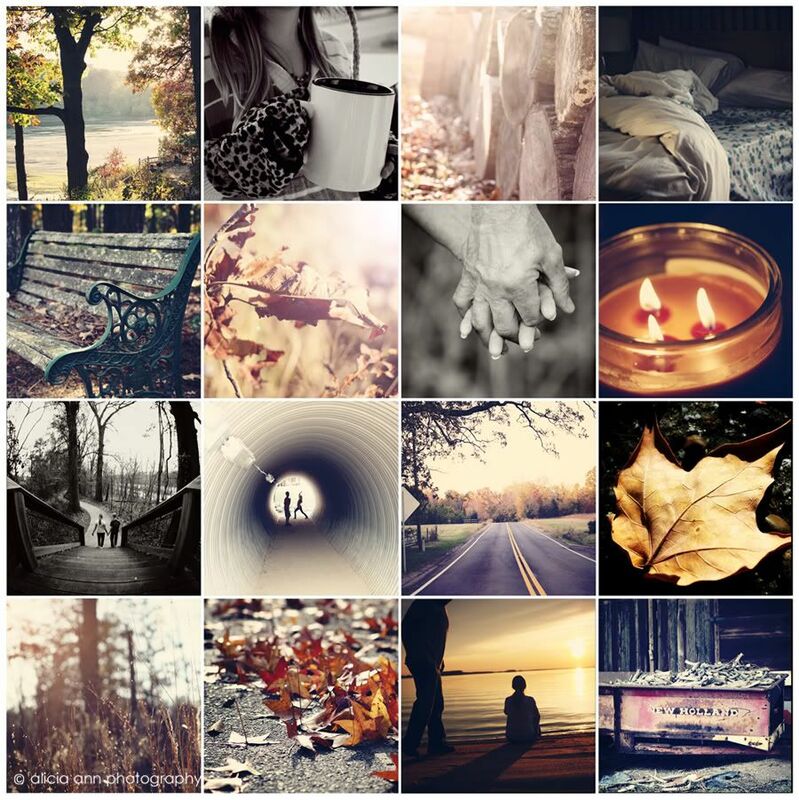 It's like a collection of fall moments bundled together ready warm the heart. Beautiful. Hermoso collage de fotos, me encantan todas las imágenes!! Un abrazo. Lovely variety of pictures. The poem is also lovely. Thanks for hosting. Oh I love them all. Although, the tunnel one is super amazing! Awww. Very cute!! Love those photos. Beautiful post! Although made for winter, it seems like perfect timing for right now. Beautiful.. love the photo of the maple leaf! Ahh! Lovely photos! My eyes were drawn to the old and new hands. Love it! Hi Alicia, I love your images. Sorry I have been AWOL lately! Hope all is well with you. I love that treat bag! love the bags, so flippin creative I can hardly stand it! I always enjoy stopping by, great shots, lovely words. I love you photo collage! Beautiful images. The fun thing about photo archives besides having pictures to post in a pinch, is reviewing all those photos and remembering when you took them. Great shots. I love the tunnel shot. As always, gorgeous photos and I also love the poem at the end...beautiful! So many lovely pics Alicia! Beautiful. Love looking back Lish! As always- beautiful images. Beautiful photo collage! All sorts of different ways to view winter in your part of the country. I love taking a trip through my archives too. It is so fun to remember things we have already experienced and look forward to the ones ahead. Hi Alicia,Nice to be here again. I took a little hiatus from blogging from the summer. I have been reading your posts of late. As always you have the most lovely photos and stories. I get to momentarily escape from everything and come along with you and your stories. Thanks for that! Such lovely photos :) And that treat bag is really cool! Beautiful warm images!! I enjoy looking back at your photos!